movement for people on bicycles. 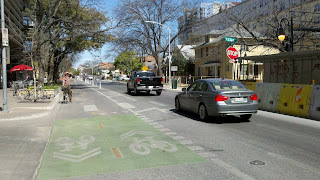 Visiting Austin, I found they have done a lot of work to improve their cycling network and are exploring cycletracks with a significant amount of emphasis and bolstered by the Green Lane Project. I enjoyed my time in the City meeting with my peers and found their implementation of cycletracks on Rio Grande to be inspirational. 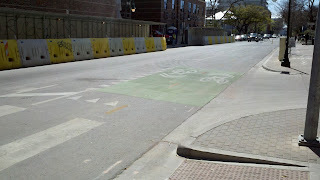 The Rio Grande cycletrack starts with a bicycle signal (exclusive movement) to transition from the 2-way facility to a more traditional in street environment south of the traffic signal. They have employed the blue light sign for "vehicle detected when blue light on" giving people on bikes a clue that there is something different here and that we want to let you know that you have been detected. 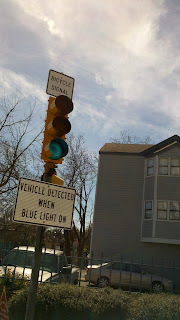 The "Bicycle Signal" sign seems to define the indication as it is exclusive for bicycle traffic. I wonder if it was intentional to define that the bicycle was a vehicle through the two separate signs. The installation is very important in that it allows a crossing that is long through the intersection. It addresses a skewed crossing that without such at treatment would have been a significant barrier to making the movement on your bike. The City has been focusing on eliminating these sorts of spots of bicycle stress in their system. The study by Furth suggested a set of criteria based on Dutch bikeway design criteria for levels of traffic stress (LTS). LTS 1 is suitable for children; LTS 2 represents the traffic stress that most adults will tolerate; LTS 3 and 4 represent greater levels of stress. I am not sure that the signal and geometric design of the intersection results in a level of stress of #1 because it is such as large crossing. North of the intersection with Martin Luther King Jr. Blvd and the traffic signal, the treatment is a 2-way cycletrack on the eastside of the street. The City removed on-street parking and the street is a one-way street in the northbound direction, so the southbound person on a bike is adjacent to the curb and the northbound movement is a left hand side bicycle lane. The City has taken care to have treatments at intersections, providing stop signs for vehicles and yield signs for mitigating bicycle/pedestrian conflicts. I surveyed the after condition and went back to google maps for the before conditions. There is construction on the east side of the street associated with some housing that is being built for the university. The traffic volumes along the corridor did not need the multiple lanes, so this example is similar to N Williams in Portland. It is interesting to think about the possibilities of the corridor and what they have done here. It's a great example of the Green Lane Project. The visit to the corridor showed a lot of pedestrian environment and significant retail activity on the corridor. I didn't have time to explore the other potential southbound routes to determine whether the 2-way cycletrack was necessary, but I like the facility more than I thought I would and reminds me of some of the examples I experienced in the Netherlands. 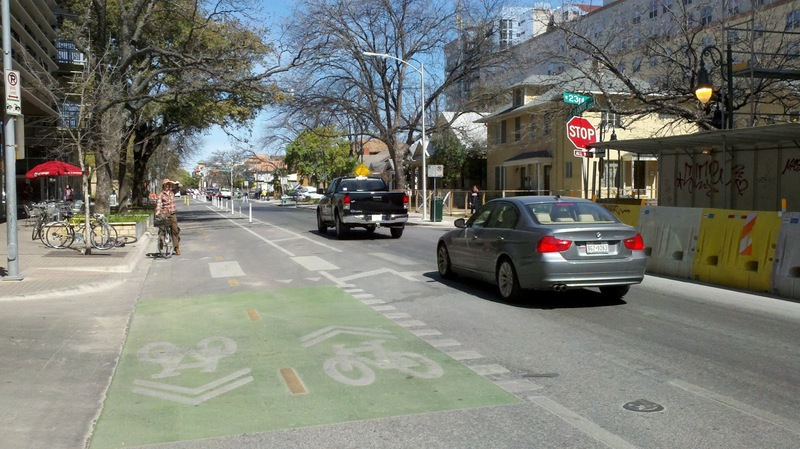 The staff I met with in Austin seemed energized by the mission, excited about the NACTO Bikeway Guide (it was brought to our meeting), and interested to learn about what Portland has done with traffic signals to improve conditions for cycling.